Master difficulty isn't that tough for two level 50s, either! Gems are indeed great. OK. I'll keep crafting them. The blacksmith is actually useful! The level 51 bow I forged with him was about double the power of any other bow I had in my inventory. I am going to forge like crazy from now on. I am not sold, though, on crafting Legendary items. I got a blueprint for one, and the resulting crossbow was sub-par. I still don't understand the point of the merchants. They sell weak stuff. That's not a lesson learned, I guess. Just confusion. All those sigils and shapes I'm unlocking is to create a cooler flag for myself? Not interested at all. Act IV is the least interesting act in the base Diablo III game. The scenery is uninteresting and the gameplay tasks over the tipping point of tedious that the rest of Diablo III fails to fall over. Act V's art direction is phenomenal. 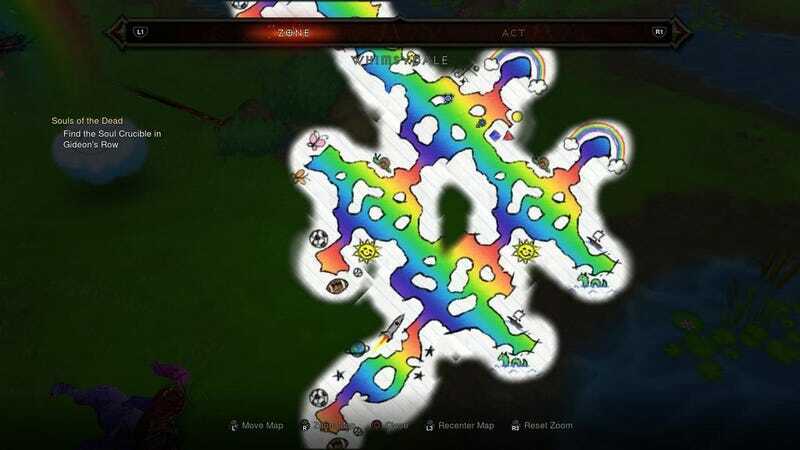 The rainbow-colored bonus area with the My Little Pony and Care Bear stand-ins is an XP farm. Awesome. Chain of Torment and Polar Station sentries are equally awesome, as is the power to lay trails of fire as you somersault through crowds of enemies. If Diablo III is the great game and Too Human was the not-so-great game, then it is a sad state of affairs that only the latter lets me auto-sell items that are under a certain quality. Blizzard, you're wasting too much of my time with all this inventory management. I don't want crappy gear. Can we not just auto-salvage items below set thresholds? Come on! I should probably Google what the ++++ stats mean, because I still don't get that. Ok. Done... Oh. Yeah, I should have guessed that. Dare I say that dying all my gear blue was cool? Oh, god. Now I'm going to be obsessing over which dyes I apply to my gear? All in all, a very educational session. Laugh at me if you want. I'm still very new to the world of Diablo gaming! I should probably re-read Fahey's tips.